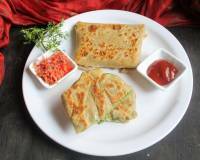 Here is a wholesome and nutritious Stuffed Paratha made from Aloo & Bathua which you can make for your morning breakfast and serve it along with pickles, dahi and a glass of Adrak chai. 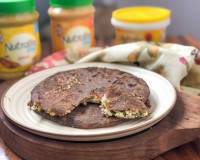 You can even pack this into your kids lunch box as well. 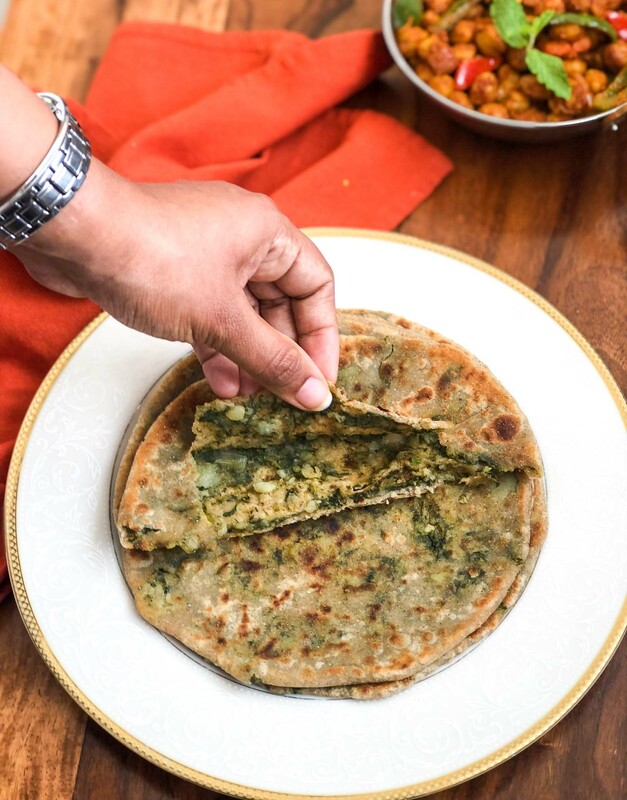 The Bathua Aloo Paratha Recipe is a wholesome and delicious recipes where boiled aloo and chopped bathua are combined along with garlic onions, green chillies and spices to make a lip smacking filling for the paratha. 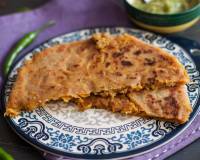 These parathas are cooked in ghee making them crisp and perfect for a special weekend breakfast. Bathua also known as pappu kura in Telugu, paruppu keerai in Tamil and lambs quarter in English has a rich earthy flavor which is perfect for a paratha. This leaf usually grows in winters in North India but is mostly available throughout the year in southern India. Bathua leaves are loaded with fiber, are a rich source of vitamin A and crucial minerals and it purifies blood. Bathua Leaves are usually boiled and eaten and can be substituted for spinach in most recipes. 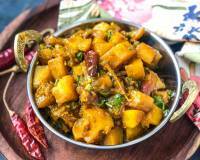 To begin making Aloo Bathua Paratha, place the potatoes in the pressure cooker along with some water and pressure cook for 3 to 4 whistles and turn off the heat. Allow the pressure to release naturally. Once released, peel the skin and mash the potatoes and keep aside. Next make the dough for the parathas. In a bowl add whole wheat flour and salt and mix water and knead till you get a soft dough. Keep aside till you make the filling. Separate the Bathua Leaves from the stem and discard the stem. Wash and chop the bathua leaves. Preheat a pan on high heat; add the bathua leaves and cook the bathua leaves until soft and all the water has evaporated. Ensure there is no residue of moisture from the bathua. Turn off the heat and allow the bathua leaves to cool. In a mixing bowl, add the mashed potatoes, the cooked bathua leaves, chopped onions, green chillies, garlic, salt, garam masala powder and amchur powder. Mix the aloo bathua paratha mixture well. Give it a taste and adjust seasonings according to taste. Preheat a tava on medium heat and start making the parathas. 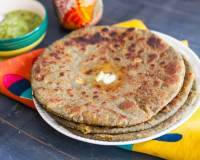 To make the paratha take the required portion of Aloo Bathua Paratha dough and dust with dry wheat flour and flatten to a three inch diameter. Take the Aloo Bathua stuffing which should be larger than the size of the dough you took and place in the center. Fold the edges and bring the dough towards the center to close the ball. Remove any excess dough at the top. 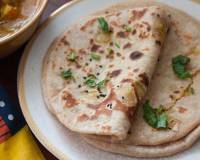 Place the Aloo Bathua Paratha on a flat surface dusted with wheat flour and roll gently. 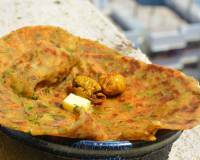 Once you have reached the desired size and thickness place the Aloo Bathua Paratha on the preheated tava and cook until the Aloo Bathua Paratha turns golden on both sides. 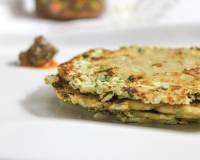 Smear ghee and cook the Aloo Bathua Paratha until it is cooked through and is golden brown and crisp. Keep flipping the Aloo Bathua Paratha during the above process. Once done, remove from the tawa and proceed to make the remaining parathas the similar way and serve hot.